The Adtran Atlas 550 is a WAN simulator capable of simulating phone systems and other types of networks. It took a bit of time to figure out how to log into the serial console of the Atlas 550 and setup the ports with phone numbers and a minimalistic dial-plan. In Mark’s pile of old computer parts, we were able to find a GVC 33.6kbps voice/faxmodem and a US Robotics 56kbps faxmodem. The US Robotics modem was connected to the OpenBSD machine as US Robotics’ “AT” command set has better support. 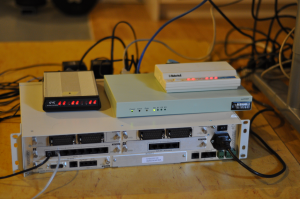 For the OpenBSD machine we used a Soekris Engineering Net5501 with an additional serial port installed. The OS was installed via PXE-boot onto a 4GB compact flash drive. MGETTY would wait for informational responses from the modem such as “RING” and “CONNECT” and choose the next course of action based on those responses. PPPd uses any username and password from the /etc/passwd file. Vista (for some reason after an unsuccessful dial-up attempt, the serial port would become non-responsive). A truck hits a telephone pole near your datacenter. In the process both your primary internet connection and your analog telephone line are knocked out. As a good system administrator you have provisioned a secondary upstream link, but some configuration is required to bring it online. We were able to acquire a MultiTech Systems MultiModem GPRS Wireless Modem, model number MTCBA-G-F4 to use for this segment of the project. A serviced SIM card was also obtained. The biggest problems we encountered was the lack of clear documentation – Appendix A (not included in the online version) illustrates this problem quite nicely – people we talked to about what we were trying to do had never heard of this before, and even if they had some idea about what we were trying to do, they would provide us with misleading or wrong information. The Cellular Modem was purchased with this plan in mind – use it as if it were just another POTS modem. Connect it to a serial port, and use it for point-to-point connections to a POTS modem or a second cellular modem. This failed spectacularly. When a cellular device initiates a call it needs to reserve a certain amount of channel space on the cellular network for the connection. With a POTS modem there is always a carrier signal bidirectionally between the two modems to maintain the connection and to enable detection for carrier loss. Conversely, modern cellular phones only transmit or receive data when there is sufficient input to warrant actually sending a packet. In other words, if neither party on a conversation is actually talking, the throughput is almost zero. Secondly, each packet of data may use a different circuit or carrier frequency if there is congestion on another. This hopping between circuits allows the tower to be oversubscribed with fewer problems. For a cellular modem to be able to connect to a POTS modem, it would need to negotiate a static circuit and be passing data non-stop. The cellular providers all discourage this practice. This is referred to as a Circuit Switched Data (CSD) connection. We soon found out that the provider we were using silently stopped allowing CSD connections sometime prior to 2005. There is no documentation about this change on the provider’s website. We were only able to come to this conclusion based on it not working, and rumors we saw on various Internet message boards. After realizing that CSD would not work, we found ourselves flipping through the manual looking for alternatives. PPP was mentioned in several places so we decided to investigate further. We were already convinced that there must exist some method for us to use the cellular modem for data connectivity. The Soekris/OpenBSD machine must initiate a PPP dial-out connection to the wireless provider’s network. 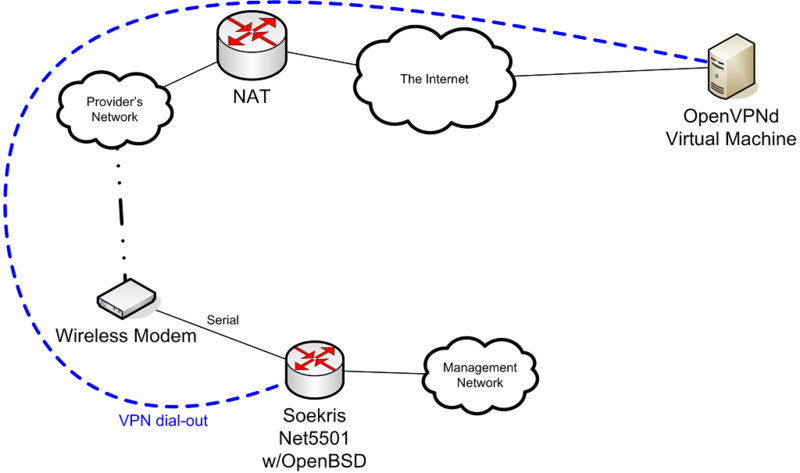 An administrator should be able to SSH or VPN into the OpenVPN server, and then connect to the Soekris machine and thus the management network. It took us much longer than expected to establish a PPP connection with our wireless provider. As a result, we were unable to actually implement network-fault detection and automatic dial-out. OpenVPN configuration was also ignored. Had we sufficient time, it is likely that we would have either used OpenBSD’s built-in “ifstated” or Nagios to detect problems and initiate the dial-out. Another idea that was tossed around was waiting for a specially crafted SMS message to initiate dial-out. To initiate a PPP data connection, the modem only requires data connectivity. There is no requirement for voice nor for SMS messaging. Unfortunately, data connectivity in Canada is reasonably expensive. From that point on, there was no indication that the modem had received any SMS messages. Interestingly, there is only a split-second delay between submitting the ATD command and having the “CONNECT” response. This is likely a benefit of running a modem on a digital network. It’s important to discuss this AT command. Just like in the old POTS modem days, the “D” in “ATD” means “dial”. Unlike the old POTS days, we don’t need to specify “T” for tone dialing. GSM and GPRS are digital technologies, so ATD is sufficient. As far as the actual number is concerned – it’s not a typical phone number. In fact, the “*” character seems to be reserved for GSM information, as is the “#”. From the documentation that comes with the modem we have been able to piece together a bit more information on this subject. The first “*99” indicates a “Request GPRS IP Service D” meaning data service via PPP connection. The “***1” specifies a “particular Packet Data Protocol (PDP) context”. The “#” likely represents the end of the code. Most of the examples, in addition to what we were told by the cellular provider’s technical support staff indicated that the appropriate number is “*99#”. Although that may work on some devices, it isn’t universal. Many hours were spent trying to determine why “*99#” would connect, authenticate (via PPP) and then promptly disconnect. In desparation, we tried the “*99***1#” that was mentioned in a couple locations in the modem’s manual. We had avoided this number because the manual refered to standards in place in the United States, and not necessarily Canada. set dial "ABORT BUSY ABORT NO\\sCARRIER TIMEOUT 5 \"\" AT OK-AT-OK ATE1Q0 OK \\dATDT\\T TIMEOUT 40 CONNECT"
No username, nor password, nor access point name (APN) was required for the connection. All of the documentation we encountered indicated that all three of these parameters were required. Notice the RFC1918 (Private) IP address that is assigned during the PPP negotiation. We were unable to find any method of obtaining a public IP address. This does limit some options and applications of this modem. It could be interesting to use a pair of these in a future project to attempt to establish a point-to-point connection between two sites. For this segment we again used the MultiTech GPRS Wireless Modem. This was one of the few wireless modems available that used GPRS and GSM with an RS-232 interface for both data and control. This modem uses the traditional Hayes “AT” commands, with many additional parameters to setup and control wireless connectivity. The goal was to determine if it was possible to use the wireless modem to send SMS text messages directly to the phones of system administrators via Nagios. Yes – is the short answer, and the long answer isn’t that long. Nagios allows plugins to be used for just about everything. These plugins are passed information like the contact’s cell phone number and the message to send. Although it would be fairly easy to make a plugin talk to a serial port and deal with the AT commands in order to send an SMS message, we ran out of time to actually write such a script. As proof of concept, we were able to use a terminal program (in this case “minicom”) to send out SMS messages. Text in green represents data or messages sent to the terminal equipment from the modem. Send an SMS message. It should be noted that <ctrl-z> is character 0x1A in ASCII. In the example above, the phone number is that of the recipient. The modem only requires a phone number (to originate the messages) and SMS messaging service. There is no requirement for either data connectivity nor for voice connectivity. As a result, this would be fairly inexpensive to operate in production. We were successful in creating a “proof of concept” for a couple different methods of secondary connectivity. Certainly more work would be required in order to implement any of these methods in a production environment. The PPP stack continues to exist in production today, but we feel that it has become a bit of an anachronism. It is barely mentioned in modern documentation. Traditional analog modems which were once quite common have now been replaced by DSL and Cable modems which are much faster, but rely on both existing infrastructure and a service provider that is interested in mass-market solutions rather than unique and flexible solutions. We fear that it may get to the point where no usable documentation exists for some of these very flexible technologies. 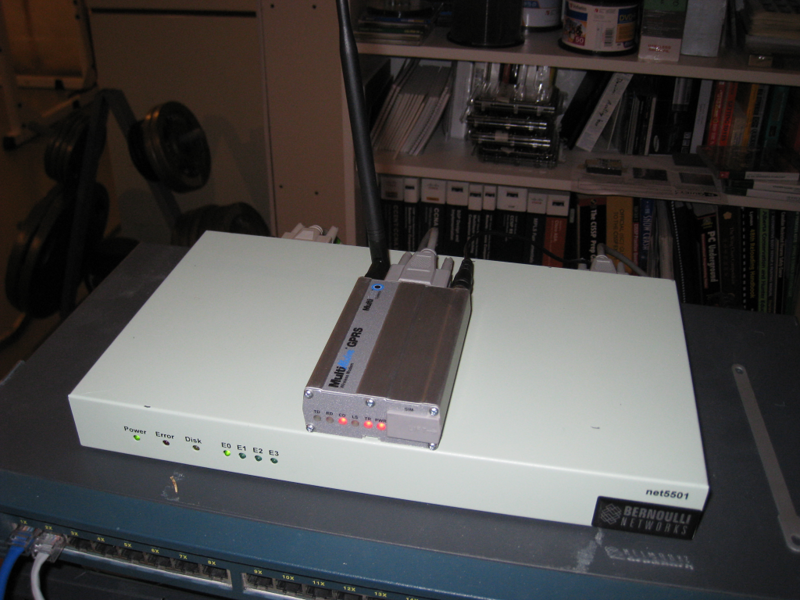 For Internet-free notifications, a simple serial-connected wireless modem is quite effective. This entry was posted in Network by tpb. Bookmark the permalink.